Sites Megalithiques de la province de Xieng Khouang is part of the Tentative list of Laos in order to qualify for inclusion in the World Heritage List. I visited the Plains of Jars at the end of October just after the rainy season when the valley is still nice and green. It gets cold and chilly up here so if you are thinking of combining this with other areas in South East Asia be aware you need something warmer for the evenings here. I stayed at the Kongker Guest House which I don't really recommend but Mr Kong leads a colorful daily tour of the Plains, which I do recommend because it is cheap and gives you more than just information about the site, but maybe bit too much about the Secret War. If you are just interested to see the jars in maybe half a day you can hire a private tour for $50+ and decide how many of the 3 sites you want to see. In a way, seeing Site 1 shows you pretty much everything about the jars already and takes the longest to visit of the three. I will concentrate my the on the sites and not the tour, although I may want to mention that visiting the bombed old capital and the stupa are not worth the time and money. Once you get to the first site you have a small museum about the history of the jars, theories more or less, but more than they had years ago when first trying to inscribe the place. Basically ICOMOS told them to do research into the jars and they have no chance of getting inscribed for just a bunch of stone structures. A university team from Australia came along and did so resulting in today's results with research continuing at some of the 52 sites that are mostly inaccessible for tourists, and those that are only be trekking on foot. As for Site 1, you then either walk or take a small golf cart to the range, which are in fact hills or jars. There are various generations of jars as can be seen by the alterations to the tops. These jars don't have lids and although there was one placed on a jar rather unfittingly, the “lids” are most likely grave markers for less prominent uses, perhaps poorer dead. A big problem with the protection of the site is damage. Bombs did plenty during the war, nature did its job rather strongly with trees cutting right through some of the jars splitting them into shards, worst I found the Laotian tourists picnicking and photoshooting in the area, placing their stuff all over the jars and naturally sitting or leaning on them as well. This should be strongly discouraged by guides as the signs don't seem to mean anything, and our guide didn't seem to mind any of it either. Sites 2 and 3 are less visited and only have a ticket booth. I found this nicer myself but it didn't add much to the experience either. They are not too far off and thus is a day trip. My personal idea is that they might just store water in the jars for the dryer season, with wooden kids now gone. The graveyard idea doesn't seem quite right or a temporary placement for bodies is a little odd. As for coming here, I took two cheap flights by a small LaoSkyway biplane that included a monk and a lady on a stretcher, but there is also a more expensive flight by Laos Air that takes you back to Vientiane. Some people take the bus but I only hear bad things about it. Finally, MAG are doing a good job at clearing the areas of unexploded UXOs, with the 3 sites now perfectly save for visiting. Ever since reading Paul's and Els's reviews of the site and it's listing in our Top Missing survey I have wanted to go to the Plain of Jars. I had looked at the map repeatedly, astounded how long it can take (5h or more) to travel less than 250km. 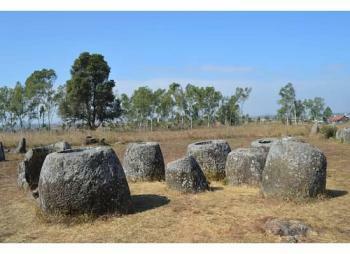 Still, I decided to travel on to Phonsavan to see the Plain of Jars. As our guide was quick to point out, the Jar Sites are not actually in the plain. All Jar Sites are located on hills. The hills are embedded in the Xiangkhoang Plateau where agriculture takes place. There are plenty of Jar Sites spread across the plateau. Visitors are normally taken to Jar Site 1 to 3. Jar Site 1 is the closest to Phonsavan and the biggest of the three. It also has an attached museum providing some background on the Jar Sites. Jar Site 2 and Jar Site 3, meanwhile, have the nicer scenery and I enjoyed my visit more. The Jars are weird (who would create Jars? and why?). The most accepted interpretation is that these are related to burial rites of the local population. While nowadays all sites open to public have been cleared of unexploded ordinances, you will encounter plenty of remnants of the Laotian Civil War (bomb craters, trenches, danger signs) along the way. The jars also took damage from the extensive bombing the Americans conducted in their covert war. In our case we got to listen in on a bomb clearing. Frightening. Without a doubt the site has OUV and should be inscribed. However, I had expected a more stellar site than what I actually found. It's a good and worthy site, but not a great one. Rapa Nui may be considered similar, but the scenery and the artwork on Easter Island are way superior to the Plain of Jars. As stated by Els, there are two options for getting to Phonsavan: by plane or by bus. Having travelled by bus from Luang Prabang to Phonsavan (which is the shortest available option), I must stronlgy advise to go for the plane option if available and affordable. The views from the bus may be memorable, but the roads are curvy and not in a good shape. It took us 8.5h for the 250km, including a 30min lunch break and a 1h break caused by the road being fully closed for ongoing construction. Seeing the state of the road I feel reasonably confident that constructions will continue for the foreseeable future along the road..
For those still keen on going by bus, the primary routes are those to Luang Prabang and Vientiane, but there are also connections to other parts of Laos available (Pakse, Paksan, Savannakhet, Thakek, Viengkham, Vangvieng, Vinh) plus connections to Vietnam (Hanoi, Hue). From Luang Prabang you have the option to go by minibus or big bus. The tourist agencies and hotels will mostly sell you the minibus trips. And that's how I went. Our bags were safely stored on top of the bus and generally the comfort and space was fine. The flights to Phonsavan aren't that expensive. There are at least 3 flights a week (Mon, Wed, Fri) from/to Vientiane. My recommendation would be to fly in on Monday/Wednesday and return on Wednesday/Friday. You can either join a tour, get a driver or rent a scooter yourself. The last option (scooter) may be a bit tricky as our guide pointed out. Plenty of Laotian drivers don't have a driver license. And in the case of an accident, you either have to stick around till the matter is resolved (weeks). Or you cover all damages, disregarding who is at fault. Finally, road conditions are pretty terrible. So, I would recommend to get a driver/join a tour. I joined a tour from my guest house for 20€. Cheapest tours should be available for 15€. Problem was that we had some French joining the tour and they are the worst when it comes to time management and moving ahead. So, if you are not travelling alone, getting a private tour may really be a good option. Tours include a simple lunch. You should make sure that the tour visits Site 2 and Site 3 as these are way nicer than Site 1. Our guide also mentioned the largest Jar Site: Site 52. This can only be reached with a guide and a 2 day treck. Don't attempt to do this on your own as the whole landscape is littered with unexploded ordinances. If/When the site is inscribed the locals are hoping for a tourism boost. For this to happen, the infrastructure needs to improve significantly. Apart from the cumbersome travel, Phonsavan also needs better hotels. The current offering is rather simple. In addition, there isn't really much to do around Phonsavan as I can attest as I am writing this post while waiting for my flight this afternoon. Phonsavan is a very young city, founded after the original capital and then French administrative center at Muang Khoun was nearly completely destroyed in the Laotian Civil War. 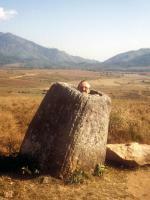 As a consequence there is little to do than the Plain of Jars excursions. Local agencies will also offer the usual "visiting the locals" and "buying local handicraft" trips, but I am not a big fan of those. 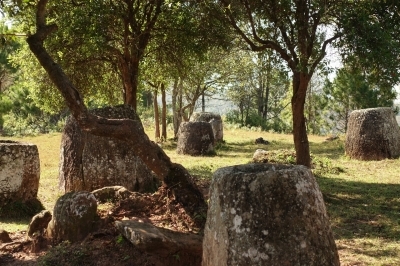 Effectively, a trip to the Plain of Jars costs you one day to get to, one day to visit, and one day to get out of. You may want to consider if this is worth it to you. From Luang Prabang, I flew (via an overnight in Vientiane) to Xieng Khouang Airport, the air gateway to the Plain of Jars, where I stayed at the Vansana Plain of Jars Hotel in Phonsavan (www.vansana-plain-of-jars-hotel.com). 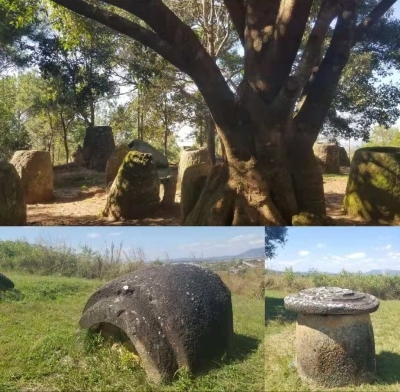 I pre-arranged a tour of the Plain of Jars with Tey Lassada, who is responsive, well informed and fluent in English (he can be contacted at lasdadatey@gmail.com). In order to avoid crowds, which were minimal in any event, we visited the sites in reverse order, beginning at Site 3 (which has about 150 jars on a wooded hillside), then Site 2 (spread around a pair of hillocks) and finally Site 1 (the largest collection with 334 jars or jar fragments). Among the thousands of Tentative Sites, this is one of the few that should be promoted to WH status right away. The Megalithic sites of Xieng Khouang province, better known as the Plain of Jars, are so numerous and shaped unlike anything that you will see elsewhere in the world. Getting there is still pretty adventurous - it is either a flight or a bus ride from Vientiane / Luang Prabang. I did the latter (from Vientiane) and it took 13 hours. Site 1, 2 and 3 are the main sites to visit. Others have opened up now too, but they are not on the itinerary of the guided tours. I went on a minibus tour with 3 others, organized via a guesthouse in Phonsavan. The most interesting new development is the discovery of a quarry some km's away, where they also found half-finished jars. Our guide told that a foreign archeologist was working at the sites now, to piece together more about the history of the jars, who made them and why. They will not apply for WH status until more scientific evidence is found to sustain the theory that the sites are cemeteries. There's an entrance fee now at each site (10.000 kip, 0,90 EUR), and at site no. 1 there's a little souvenir shop. All sites also have a small drinks&food stall. It is all very low-key however. At sites 2 and 3 there were maybe 10 tourists when we were visiting, while there were about 30 (mainly Laotians) at the much bigger site 1 that is also the closest to Phonsavan. We went first to site number 3, and that is also the one I liked best due to its fine, idyllic location. Site 1 not only has the only jar with a carving on it, but also the biggest jar (2.5 meters) and the only jar which still is covered by its lid. The mysteries that still surround this Plain of Jars, the strangeness of the objects and the remote location reminded me of Easter Island. Many Prehistoric sites attract the description “Enigmatic” – meaning that the exact purpose of the objects on view is unclear - and those of the “Plain of Jars” certainly justify the epithet! Just why were these enormous stone jars carved and scattered across this remote plateau in Northern Laos? We visited in 1997 – flying from Luang Prabang into the ramshackle provincial capital of Phonsavan. This itself was an experience as one looked down onto a countryside pockmarked, as far as the eye could see, with bomb craters. This area was the subject of a saturation bombing campaign by the US in 1969 (the area was strategically significant to Vietnam to protect Hanoi’s rear flank and its many caves provided shelter, both for the Vietnamese/Pathet Lao troops, and supplies). Phonsavan is the Laotian government’s attempt to create a new capital after the old French colonial one of Xieng Khuang was abandoned, having been totally destroyed in the war – in 1997 however Phonsavan itself was only partly formed and had an impermanent “wild west” atmosphere. we were cautioned to stick to marked paths. Wiki indicates that the number of cleared areas has risen to 7 in 2010 and also there are opportunites in Phonsavan to visit the organizations involved in helping both the task and the many maimed locals. The roads outside Phonsavan made its rutted town streets look almost good and our taxi trip to the 3 Jar sites took a whole afternoon – even though the furthest was only around 30kms away! It was interesting to note how old bomb cases etc had been incorporated into the structure of the houses we passed. The location of the jars, largely scattered in open locations on the rolling “plain”, adds to their mystery – they do not appear to be part of any contemporaneous ensembles. They are carved from single pieces of rock, mostly weigh around 600kg to 1 tonne and are large enough for a “big Westerner” (carefully!) to get inside (photo – no doubt “forbidden” now!!). From lips carved on some jars, it appears that the jars were originally covered by lids – though the flat circular stones at the sites are not thought to have been these lids but rather pit grave markers. They have been dated as belonging to the area’s late Iron Age at around 500Bc to 500CE. Their purpose appears probably to have been as funerary urns – though so little is known about the peoples who carved them that alternative views abound –see the subsequent review! The stone from which they were made was quarried some way west of Phonsavan. We were the only visitors that afternoon, entry was free and there were no tourist facilities. I understand that there are now small charges at each location and that site 1 has 2 pavilions and rest rooms “built for the visit of Thailand’s crown prince”!! We enjoyed the visit and it would be a shame to miss it whilst in Laos – indeed we perhaps rushed it too much and should have spent more time with the local tribespeople. Indeed, from photos of I have seen of the sites today, it would appear likely that Hmong and others have “moved in” with their souvenir stalls! Since I cannot read French I assume that what they are planning to apply for world heritage status in this province is the Plain of Jars. I took a trip to Laos in December 2006 with some friends to sort of escape Christmas at home. After having read about the Plain of Jars and seen pictures of them, I made sure that I went to see them, even if I had to brave 12 hours of an uncomfortable bus ride from Vientiane. These so-called jars are really urn-like structures made of stone. 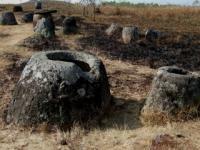 Even though it is called a "Plain of Jars" there isn't really one single plain or area where one can find all the jars in there. The jars are scattered across a wide area in the countryside in various sites of varying concentrations of jars. No one can really be sure why these jars were created. Experts theorised that they were made to store ashes of deceased people or food. But I much prefer the local theory. Apparently some king won a war and to celebrate he ordered the jars created to make and store wine. The base from which to explore the Plain of Jars is the very little town of Phonsavan, the capital of Xieng Khouang. My friends and I arranged for a minibus and a driver from the guesthouse we stayed at to take us around the area. The area is apparently the most heavily bombed one in history. During the Indochinese war, American planes unloaded tons and tons of bombs on the area. Even today, there are still plenty of unexploded ordnances waiting to be discovered. Travelling in the area can be dangerous (and therefore visitors MUST AT ALL TIMES follow the directions on the paths) but the authorities have cleared three sites for tourism. They are simply named Sites 1, 2 and 3. Site 1 is the nearest to town and definitely the most heavily visited. I think this is the site with the most jars. The bigger ones are there as well. Look out for one particular jar on which you can vaguely make out the carving of a man. I sure did not know there was such a jar until I overheard a guide telling her group about it and pointing it out to them! Besides the jars, visitors are also treated to spectacular sceneries of the Laotian countryside. Personally I find the sceneries around Sites 2 and 3 better than that at Site 1. The trade off though is that the jars at Sites 2 and 3 are perhaps not as impressive. The scenery at Site 3 is the best I think. To get to the jars, one has to walk for at least 15 minutes across scenic farmland and fields situated among the hills. It was not an easy walk but I did feel that even if I could not get to see the jars at this site, the scenery alone was worth the trip. In any case, the jars at this site were not that significant. There are apparently many more of such sites in the region but they are closed off to visitors because they are not declared safe yet. And again I will advise visitors to really toe the line! The sceneries are spectacular and one can easily be distracted and wander off the approved paths like I did! I live to tell the tale now but I am pretty sure I was lucky. I wonder if the presence of the unexploded ordnances is the reason why this site is still sitting on the tentative list after so many years. This site is definitely an important relic of a lost culture in South East Asia which in my opinion must be protected as a world heritage site.